Already it is time to leave Israel! I have the bed loaded with a number of items- clothes, brochures, pages of notes, the toiletries, various items I have picked up, cameras, and various other things. Soon it will be time to fit them in the bag. I have made arrangements to be picked up tomorrow by the shuttle at 10:30 a.m. for the flight which leaves at 2:50 p.m. This gives the shuttle an hour and a half to get to the airport in Tel Aviv and me three hours to get through the process and board. I hope that will be enough time! Our group has been breaking up for the last day. Some have left to go on a side trip to visit Petra in Jordan. Others have left for the airport. As always, saying "Goodbye," brings feelings of loss as a community comes to an end. The fifteen of us became a supportive and friendly group in just a few days. It has been good. We represent England, Australia, New Zealand, Thailand, New Guinea, and America. Of the 15, 9 are Roman Catholic, 2 are Presbyterian, 1 United Reformed (England), 1 United Methodist, 1 Anglican, and me the 1 Lutheran. It has been a good mix. We all took turns leading evening prayer. This gave us opportunities to experience each others traditions. Moving on to the overall plan from Tantur, I have appreciated the pattern and flow of the month. Week one was an immersion in Jerusalem. We visited many churches including the Church of the Holy Sepulchre. We drove to the top of the Moun of Olives and walked our way down. I confess to getting "churched out" after awhile. I was relieved to learn that I was in the company of many. Week two is when we went north to the Galilee area. We stayed two nights in Nazareth and two nights in Tiberias which is on the shore of the Sea of Galilee. It was good to explore that area. We looked at archaeological sites, a number of churches, and the natural surroundings. It was soon obvious that the north country receives more rain and is much more fertile. In addition, it gets more water from mountain runoff. We were glad to go be in the area where Jesus lived most of his life. One special place was to go to the seaside village of Capernaum and see some first century ruins. It is possible that Jesus had spent time in those homes. Week three, we went south and east into the desert. We visited Masada and Qumran. We saw Beer sheba and an outpost of the desert tribe known at the Nabateans. We walked into a canyon and listened to Scripture and the silence of the desert. Week four was back in Jerusalem but the schedule was lighter. I think this was meant to give us more time to reflect on our experiencs. A particularly strong experience was going onto the Temple Mount/Haram al Sharif and entering both the Dome of the Rock and the Al Aqsa Mosque. Throughout we had a number of lectures and presentations. We learned about the geography of the area. We looked at the Gospel of Matthew through the shame/honor lens. We looked at the stories of other ancient peoples and how they may have influenced the Bible. We learned more about the background of the Jewish festival/liturgical calendar. We heard from the leader of the Machsom Watch which is a group of Israeli women who monitor check points among other work. In addition we went to museums such as the Israel Museum, the Tower of David, and Nazareth Village. Yesterday, Friday, for our last day together, we went into the western side of the Jerusalem area. We visited two churches which are close to one another. The first was the Church of the Visitation which celebrates the time Mary went to visit Elizabeth. In Luke, that is when Mary sings the Magnificat. This statue is in the courtyard of the Church of the Visitation. I found it to be a wonderful portrayal of the meeting between young Mary and old Elizabeth, both of whom had been especially blessed. The next church we went to was to the Church of the Nativity of John the Baptist. This congregation celebrates the birth of John who came to make the way ready for Jesus. After that, we drove into the hills to get a view of the western Judean wilderness. The west is significantly different than the east due to the fact that it gets more rain. The following clip shows a bit of this area. After this, we drove to a nice restaurant for our "last lunch". As always, there was plenty to eat and eat we did! This is our group less the three who had already left to go to Petra. With this, I will bring the Israel section of the sabbatical blog to a close. As I said, I fly out tomorrow for Rome and plan to meet Gay at the Da Vinci airport on Monday. (We hope to connect without the help of cell phones!) This is the longest we have been apart in 35 years of marriage. I will close with a photo I took a couple of days ago. Several of us went on a walk into a valley just to the east of Tantur. It has a fairly large hillside with an olive orchard running throughout. When we had gone down a bit, one of our group spotted a shepherd with his sheep just below the crest of the hill. The sun was setting and we climbed up to get a closer look. 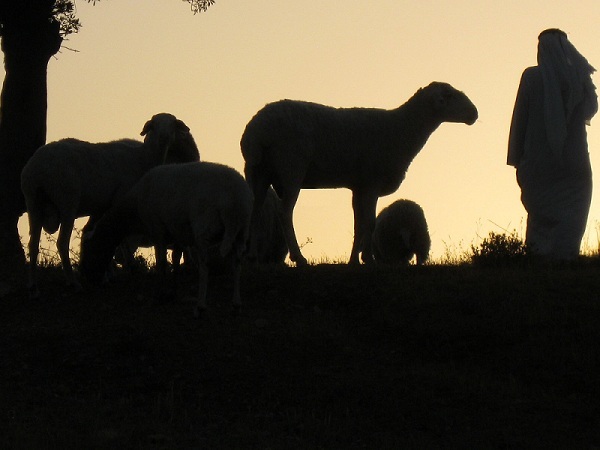 May the Good Shepherd be with us all to give us hope, life, love, and the call to follow. It is amazing how quickly the month at Tantur in Jerusalem is coming to an end. Tomorrow, three of our group will be leaving. The rest of us will be going our separate ways in the next three days. As such, this is the last full day we have together. I am glad to say that it has been an excellent one. It began with getting out of bed at 4:45 a.m. This was so because eight of us were going to leave at 5:45 a.m. for a hike in the Judean wilderness. This is the area just east of the ridge upon which Jerusalem sits. It is in a rain shadow and the moisture and vegetation drop off dramatically. The link is to a video I took just after we got to the trail head at about 6:30 a.m. It was a beautiful morning and already warm. Our hike would take us down into Wadi Qilt, to St. George Monastery, and finally down to Jericho. Our group was glad that we were going down almost the whole way! If you watched the video, this will look familiar. If you didn't, this is a view of the Judean wilderness. The sun had been up a short while and it was pretty and already warm. In the background, you can see St. George Monastery. The monastery was begun in the year 420 A.D.
As we walked down the wadi (aka canyon), we saw a number of human made caves. In the 400's and 500's, there were quite a number of hermit monks who lived in the wilderness to pursue a life of prayer and dedication to God. This picture shows the cave of the one remaining hermit monk living in Wadi Qilt. The hike was a lot of fun. As it was fairly early in the morning, the colors were vivid. I was glad to be out in the creation with a group of friends I have made while at Tantur. After we hiked out of the canyon, we met up with the rest of our group and we went to the Monastery of the Temptation. It, too, is on the side of a cliff and commerates Jesus' trial in the wilderness. The earlier video clip shows the view from the monasatery. After returning to the bus, we went to the Jordan River. Here I am wading in the Jordan. As you can see it is more of a stream at this point. It is used significantly for irrigation. So by the time it gets here, which is getting close to the Dead Sea, there is not much left. While we were there, there was a fairly large Hispanic group of Roman Catholics. This is the second baby I saw baptized by them in the Jordan. With this, we headed back to the bus, ate a picnic lunch, and returned to Tantur. This evening we will have our closing party. Those of us who remain will have Jerusalem activities tomorrow but this will be the last time all of us our together. We began our last week in Jerusalem with a trip to the area of Jerusalem which is called by Arabs, Haram al-Sharif and by Jews, the Temple Mount. It comprises about one sixth of the entire size of old Jerusalem. Since 2000, access to this area has been restricted. The reason for this is that in 2000, Ariel Sharon went on a so-called peace mission to the area and brought with him approximately 2,000 police/military personnel. This inflamed tensions with the Arab population and sparked the second intifada. Though non-Muslims do have limited access to the outside areas, they are still restricted from going inside either the Dome of the Rock or the Al Aqsa Mosque. The following photo shows some of the area. It can be surprising to think of such a wooded area here. The guide for our tour was Dr. Yusuf Natsheh, Director of the Deptarment of Islamic Archaeology at Haram al-Sharif and lecturer at Al-Quds University. He was very knowledgeable and welcoming. The following photo is of the Dome of the Rock. As I said, access to the inside of the buildings is still restricted to non-Muslims but there are exceptions. One of those is for students in programs such as at Tantur. Because of this, we were able to get on to the grounds in a time most non-Muslims are not able to and to enter the buildings. Even then our time was limited but it was a great privilege. The Dome of the Rock is on the site traditionally ascribed to two important happenings. The first is that Abraham is said to have taken Isaac to this mount (Mt. Moriah) in order to sacrifice him. The second is that Muhammad is said to have ascended to heaven from this spot. Currently, the center of the Dome is going through extensive renovations with scaffolding going to the very top. As that is the case, the following picture shows one side of the building. The artistry is stunning. After leaving the Dome of the Rock, we went to the Al Aqsa Mosque. This marks the furthest point Muhammad made in his pilgrimmage from Mecca before being taken up to heaven. I am sure that you will agree with me that both buildings are beautiful. I greatly desired to take more pictures of the interiors but our time was significantly restricted. We were grateful to have the opportunity to go inside. Here we see two of the most important structures in the Islamic world. Their artistry reminds me of the care and passion Muslims have for their faith. An important step for our world will be to see how we can both cherish our deeply held beliefs and work together for the common good of all. As last Sunday I had to wait on the bus for about 25 minutes and got to worship just as the bells were ringing, I got an earlier start today. I got to the bus stop at the Bethlehem gate a bit before 8:00 and we left at 8:00. This got me to the Jaffa Gate at the old city at about 8:25. As worship did not start until 9:00, I had some time to explore. I had heard about a little shopping area just outside the Jaffa Gate area which had a number of contemporary sculptures depicting biblical themes or characters. I was able to find it and could go through about half the sculptures before needing to leave for worship. I went back to see the other half after worship. I took a number of pictures of the pieces. Here are two of them. The snake and the temptation were depicted several times. I think this catches a great deal of Sarah's laughter in being told that she would finally have a child. It was good to be with the people at Redeemer Lutheran Church for worship. I was at the English language congregation's service. There is also an Arabic speaking congregation and a German speaking congregation. I am including a couple of photos of people from the congregation. These are Mark Brown, regional director for the Middle East for the Lutheran World Federation (LWF) and his assistant, Britt. Mark and his wife host a Wednesday evening potluck and volleyball fellowship time from about Easter to Thanksgiving at their home on the LWF campus which is located near the top of the Mount of Olives. I was glad to go there last week. These are Pastor Fred and Gloria Strickert. He is the pastor of the English speaking congregation at Redeemer Lutheran. They were most gracious and hospitable. After worship and the second half of the sculptures, I met with others from our group and went to the Tower of David. It is also known as the Citadel. The name is a misnomer because David did not have anything to do with it. It is a museum housed in the ruins of an Arabic fortress on the west side of the old city. This picture shows the courtyard of the fortress. The link that follows is a video of the view from that tower. In addition, I put on a piece about the Hinnom Valley. This is just to the west of the old city. It was used both as a burial ground and the city dump. The dump would catch fire and smolder. Because of this, it was used as the model for the eternal flames of hell or Gehenna. After that, I headed back to Tantur. As I arrived there, I thought that a video of the campus might be of some interest. Because of that, I put one together. The following link is to it. (At the end of the video, I wonder what people are doing on the tennis court. As it turns out, they were marking the lines for a labyrinth which we would walk later during evening prayer. Today, we had a half day excursion into the old city of Jerusalem. This time we did not go to churches but to areas which pre-date the churches. Our first stop was at the Western Wall of the Temple. The wall was not part of the Temple itself. Rather, it was part of the huge retaining wall built around the mountain (Mt. Moriah later to be called Zion) to support the Temple. We spent sometime simply being in the area of the Western Wall. This photo shows the men's side of the Western Wall. The following link is to a video I took while at the Western Wall. After that, we went to The Jerusalem Archaeological Park which is located in this same area. You may see some similar pictures as earlier ones as I went to the part by myself the first week of our time in Israel. After we spent some time in the museum, we went to the southern wall. Scholars think that this is the side that most people would have gone through to get to the Temple in first century. This would include Jesus. The entry point was the Huldah Gates. The gates have been filled in but the steps you see are from the 1st century. Jesus would have walked up them to go to the Temple. This picture shows the ends of one of the stone blocks used to build the wall. You can see that they were quarried and laid so precisely that no mortar was used. This is even more incredible when one considers that some of the blocks were 22 feet long, 3 feet wide, and 3 feet high. While we were at the southern end of the western wall, we were privileged to see either a bar or bat mitzvah going on. We then left to go to the "City of David" which is the oldest section of Jerusalem. This is the portion of the city which David conquered and then built on. This area is thought, by a number of archaeologists, to be the ruins of David's palace. After looking at some of the above ground structures, we went to perhaps the most important structure of all, at least as far as keeping the ancient city going. This is the tunnel which was dug through limestone bedrock to bring the water from the Gihon Spring into the city. This picture shows some of our group going down into the tunnel. This portion was dug by the Jebusites about 1,800 BC. This was 800 years before David and during the Bronze Age. This tunnel was dug by hand with bronze instruments. It boggles the mind. The tunnel would later be lengthend by King Hezekiah. The extension runs for 485 meters. People can walk through it if they would like to. The tunnel itself begins at the mouth of the Gihon Spring. The photo which follows shows the remains of the Pool of Siloam which was built at the mouth of the spring. The pool of Siloam is featured in John 9 in the story of Jesus healing the blind man. You may want to read the story as you look at the photo. We ended the tour at the pool. I do not think that is a bad place to stop. It is good to be reminded that Jesus came to heal and give sight in a variety of ways. May we all be so blessed. On Wednesday, our group left early to go into the Negev Desert which is in the southern part of Israel around the Dead Sea stretching south, east, and west. The route we took was to go down the "spine" of the Judean hills. On this ridge are situated cities such as Jerusalem, Bethlehem, and Hebron. As you would expect, as we traveled south and as we followed the hills lower until they end in the desert, the precipitation falls off and with it the vegetation. This series of photos shows that reality. This photo shows the area near Hebron. Please notice the terracing and the fields. Hebron and the area to the south is where David began as a warlord. He would later increase his power after the death of Saul and conquer Jerusalem making it the new capitol. We have traveled further south. We are lower in the hills and the rain fall is smaller. Still, it is possible to grow crops. Now we are entering the desert. The faint hills in the background are in Jordan. Near the base of the Judean hills is a fortress known as Tel Arad. It was used by David, other Judean kings, Herod the Great, and the Romans over the centuries. It overlooked the Negev Desert and served as a way to protect the cities in the Judean hills from an attack coming from the south. It also served as a place from which to launch attacks and to control the trade routes going through or skirting the desert and going to the Mediterranean Sea. This is a picture of the Arad fortress. We then traveled further south into the Negev itself. Our destination was the ruins of Mamshit. (To help clarify possible pronunciations, our guide pronounced it, "mom-sheet". This is a view of a central area in Mamshit. This is a view of the Negev Desert near Mamshit. This terrain and that around Masada reminded me of Utah. We took a short walk into the desert from Mamshit to experience a bit of its silence and then to listen to Biblical texts related to the desert. This is the overhang we used for our time of meditation and listening in the Negev. Our final stop was at Tel Beer Sheva. This is still in the wilderness and the area was the site for God encountering all the patriarchs, Abraham, Isaac, and Jacob. It is dry and the area is pretty flat. This is a view of Tel Beer Sheva. It was inhabited by many groups over the centuries. It has about 15 layers showing different time periods of use. This is a view of the huge cistern it had for collecting water. We walked into it. It was cavernous below. The following link contains video of the various sites we went to today. This last photo is of a flock of goats we passed on our way back to Tantur. There were a number of sheep, goats, and shepherds but it was tough to get a picture. That is it for today. It was a fine day to explore more of the Biblical setting, to see the remains and hints of history, and to go into the desert to listen both to it and the Word. The last passage we read was Psalm 23. It was good to hear that promise as we were surrounded by canyon walls in the desert. The first major site we got to was the Dead Sea. Though still very large it is losing three vertical feet of water every year as the Jordan River, because of so much use, is barely a trickle when it reaches the Sea. This is a view of the Dead Sea from the roadway. When we got to the Sea, we continued driving south until we got to the mountain fortress of Masada. A brief overview of its history is as follows. It was originally built by King Herod the Great as a fortress of last resort should he find himself in trouble. In the Jewish revolt of 66-70 AD, rebels took the stronghold in 66 AD. They would hold out until 73 AD, when a Roman army laid siege to the fortress. When the walls were breached, the Romans entered to find that all the rebels had killed themselves instead of being taken by the Romans and made into slaves. It has long stood as a sign of resisting even in the face of great odds. Masada is the anvil shaped plateau in the center of the photo. This shows some of the ruins on the top within the fortress. This shows the remains of one of several Roman army camps which were set up during the siege. This one in particular is that of the general in charge, Flavius Silva. This is looking west from the fortress and shows the siege ramp built by the Romans. It was built on a natural spit which led to the mountain. The spit was 379 feet tall. The Romans only had to add another thirty feet of height in order to get the siege tower in place. It was a strong experience to be in this place and to think of what went on here. After that we went for a much "lighter" activity you might say. We went to an oasis for a picnic lunch and then to "bob" in the Dead Sea. Most of us took advantage of this opportunity. About the only thing one can do is float. Our next major stop was to the ruins of Qumran. Most scholars think that this was the community of a group known as the Essenes. This group felt that Jerusalem in general and the Temple leadership in particular were hopelessly corrupt. Because of this, they withdrew to the wilderness to pursue the ways of God and to wait for the Messiah. They were devoted to the Scriptures and to this end made a number of copies of Scripture as well as other writings which were important to them. As they, too, came under attack, they put the scrolls in clay jars and hid them in caves near the settlement. These would be found in 1947 and become known as the Dead Sea Scrolls. This shows some of the Qumran compound. This is one of the caves in which scrolls were found. Obviously, keeping the holy story safe not only for themselves but for others was a priority. It reminds me of just how important the story of God and God's people has been and continues to be today. The following link is to a video which shows some of the Dead Sea and the rest is about Masada. This then has been Monday on the east side of the Judean hills. It has been a good and strong day! It has been a week since I last posted to the blog. Our schedule took us to the Galilee area in the north of Israel for this past week. Throughout, we had either no or very limited access to the internet. As such, this posting will be on the long side. You may want to take it a piece at a time. I will go through the week on a day by day basis. We get on the bus with our driver Akel and guide, Ghada Boulos. He is a fine driver and Ghada is fun and very knowledgeable. Not only has she done extensive study, she grew up in Nazareth. She is a Greek Catholic Malchite Christian. Our first stop was to Caesarea Maritima. This was a town built by Herod the Great. It is on the Mediterranean Sea. It had a theater, a hippodrome for chariot races, and a palace. After Herod died, the palace would be occupied by Roman procurators including Pontius Pilate. The Apostle Paul was held here for two years following his arrest in Jerusalem. The city served as the capitol of Palestine for nearly 600 years. This shows the theater. It could seat 4,000 people. This a view of the ruins of the palace with the Mediterranean Sea in the background. Here I am with two others from our group. It was fun being at the beach. The Roman aqueduct is in the background. When built, it ran for 10 kilometers bringing water to the city. After we left Caesarea Maritima, we drove to the ruins of the Sepphoris. This was a Roman town which served as an imperial administrative center not far from Nazareth. Because of this, there was much wealth in the town. This is a mosaic from a villa in Sepphoris. I am sure you will agree that it is a beautiful piece of art. It also demonstrates the affluence of the city. After this, we drove up to Mt. Carmel. This is the mountain on which the prophet Elijah had his contest with the priests of Baal. (1 Kings 18). The following link is to a video which I took from the top of Mt. Carmel. We began the day by going to the Basilica of the Annunciation. It commerates the announcement by the Angel Gabriel to Mary that she would bear the Messiah. (Luke 1:26-38) The basilica is in Nazareth and is the largest church in the Middle East. The following link is to a video I took just following a worship service in the grotto of the basilica. This is a photo of a statue of Mary in the courtyard of the basilica. You may be able to make out that she is standing on a snake. This refers to the comment in Genesis 3 about overcoming the tempter. After that, we went to a YMCA site which recreates, as best as they are able to ascertain, what first century Nazareth looked like. It was an interesting place with a number of volunteers working in grain harvest, carpentry, and weaving. This is a picture of thrashing grain using a donkey to walk on the wheat and so to break it down. We left Nazareth and made our way to Tiberias which is on the Sea of Galilee. This was our first opportunity to get to the Sea of Galilee that day. We spent a good amount of time at Capernaum. This is the seaside village which Jesus spent time in as an adult. The following link is to a video which shows the ruins of a family's housing complex in first century Capernaum. Later, we went to a kibutz which housed a unique find. In the 1980's when the Sea of Galilee was low due to a drought, a fisherman found an ancient fishing boat. It was preserved and was found to be from the first century. It would have been a boat like this that some of the first disciples would have used. This is a view of the remains of the boat. This is an artists rendering of what the boat may have looked like. We left the kibutz and walked to a boat which took us on an hour ride on the Sea of Galilee. The link is to a video from the Sea. Today we drove to the far northeast corner of Israel. Our first stop was to the ancient city of Dan. This is one of the centers which Jeroboam strengthened when he led the northern tribes of Israel to split from Judah in the south. As a way to keep the country independent from the south, he set up two worship places to be in competition with the temple in Jerusalem. This is the actual site of the "high place" set up by Jeroboam. The metal stand in the middle is a re-creation of the size the altar is thought to have been. After leaving Dan, we went to see the Syrian border on the Golan Heights. The link is to a video of that visit. It was very interesting to be in that area after having read about it for a number of years. We then went toured the ruins of a fortress called Nimrod's Fortress. This was built by Saladin as a way to block the Crusaders from going to Damascus. It was quite large and still impressive. The photo shows some of the ruins. The "castle keep" is in the background. We left Tiberias and then stopped just done the road at a kibutz which offers Christians the opportunity to get baptized in the Jordan. The river is large enough at that point to provide a good opportunity for this. This is the Jordan close to Tiberias. This photo shows some of the areas for baptisms. We would then go to the ruins of a large town called Beit She'an. It was a Roman town and was quite large. This is a view of the main street. This shows the distruction that an earthquake caused in 749 AD. After this, our last stop was to Mt. Tabor which has traditionally been thought to be the place of the transfiguration. We went to the top and visited the Church of the Transfiguration on the top of the mountain. After that, we took a two hour drive back to Jerusalem. We followed the road on the east of the country. The link is to a video which shows some of the Judean wilderness and the road from Jericho to Jerusalem. At that point, you will see that the country is arid and dangerous if one is not prepared. This is part of old town and it used to be a thriving area. Now because of intimidation by settlers and soldiers, it is close to being a ghost town. This is a view of inside the Mosque of Abraham. These are Israeli settlers returning from worship. Please note the automatic weapon. This photo shows one of many soldiers we saw in the old city. At one point we found ourselves surrounded by a squad of soldiers. They "escorted" us for 10-15 minutes. They would not talk with us. My sense is that they were trying to make us feel unwelcome. It was interesting to be seen as the "enemy" simply by walking around the area. We also had a guide from the Christian Peacemakers Team. Paulette was our guide. I call her "justice with a smile." She is a Franciscan nun from the United States. These then are some comments about the past week. I did not share about all of the sites we visited. That will be for another time. Also, we ate at some very interested places- a Druze village and a Circassian village. It has been a rich time. I look forward to the coming week.